No, that's not correct. They can and may eat anything that they can fit in thier mouth. The safe bet is to make rocks at least head sized. I listened to you guys awhile back and removed all the small gravel tones. I now have larger ones and things seem to be great. They can still dig like they love to, but are not able to get the gravel in their mouth! thx so much for the advice.... one of my baby turtles were eating the rocks and not their food but i got new big giant rock and now their starting to eat their food! I was glad when I read this since I had no idea. I got rid of the gravel and 2 months later I saw some orange gravel. I know they eat what they want in the wild but at home we can give them everything they need to have a great and long life this is one of those things. Posted: Tue Sep 09, 2008 6:34 pm Getting stuck??? I'm scared to put much of anything in Yertle's tank--I'm not sure what's safe. He got his head caught once in the basking ledge I had for him. We were lucky, I was close by, and grabbed him. The ledge was replaced. I hate it that he's bored, but better bored than stuck? Comments from anybody on something safe for him? He's about 4 1/2" long, and in a 29 gallon atnk that's about 1/2 full. All that's in it now is his ledge, a heater, and some rocks-too big to eat, but too small to get stuck under. How can I know that a small limb would be safe for him to crawl around on and play with? If he chews on it? We tried one once, but I worried when it started to produce splinters. Maybe I worry too much, but I really adore this little guy and want to do the best I can with him. He learned a trick--I have to brag! He goes up to the surface of his water and slaps the water like mad, then looks at the floor beside the tank. Again. And again. It took me the longest time to figure it out. He's found out how to make rainbows on the floor from the reflection in the water. He splashes and watches for 10 or 15 minutes every few hours. I'll tell you the first thing is going to be to fill up his tank! He should really be in no smaller than a 50 gallon tank if he's that large. The rule is 10 gallons for every inch of shell. Who ever said turtles were slow? I have heard both, which one is true? A) Turtles, like goldfish, will grow to the size of their environment; and B) They grow the way they grow, envirnoment size is irrelevant. Any other ideas on his tank? B is true. alot of people think that they grow to their environment and the turtle suffers and is very unhealthy in a small tank. B is true for goldfish as well. "Growing to their environment" really means dying when it gets too small. Goldfish are supposed to live more than 10 years - ever had that happen in a small bowl? For your stand - I wouldn't worry about floor supports with a 29 gallon; it's not much weight. Once you get your final tank that is around 100 gallons, you will want to orient it perpendicular to your floor joists, or place it in the basement or another room with a concrete floor. The bottom of your stand should have bottom supports placed vertically across the length, at least at the front and back. Do not use legs or assume a piece of wood laid flat will help distribute weight. and the water stays clean more! because RES will find all the foods and dont waste any. 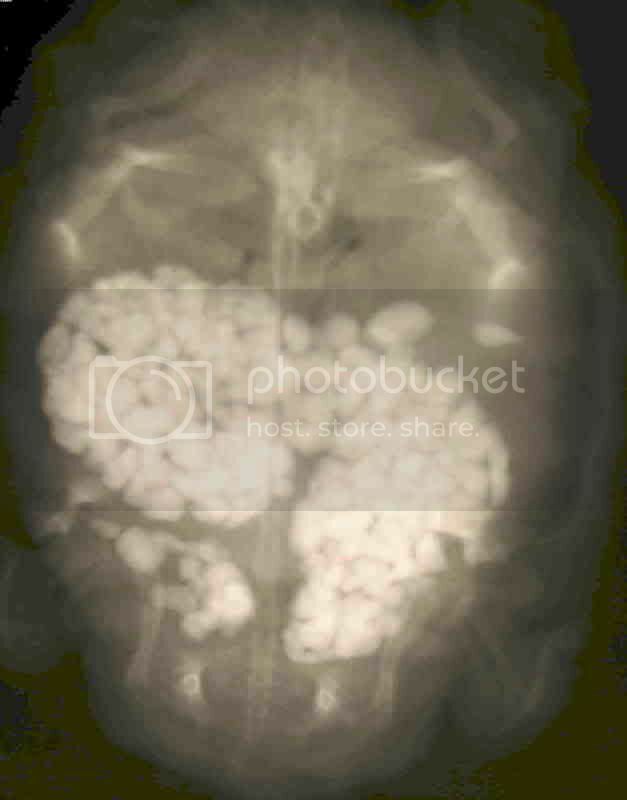 I found this picture on a veterinary website (http://www.emersonanimalhospital.com/610777.html), it is an x-ray of turtle that decided to eat gravel. All the white spots are individual pieces of gravel. This is what happens when you put gravel in your tank. Most turtles eat it and most owners don't think their turtles are eating it. Why take the risk? Wow, that picture is scary! lol I have removed all the gravel from my tank about a month ago. I been reading on here how dangerous gravel can be, but I was in denial thinking my turtle wouldn't eat it, he is very picky and won't eat anything new (I am now trying to get him to eat more veggies and it difficult lol) However one night I was watching tv and I saw him bitting down and I was wondering what is he eating? I looked into his mouth and saw one piece of pink gravel! That was the last draw I put him in his feeder bucket and removed all the gravel. Since then I have nothing on the bottom of the tank and he seems fine with that (I though he would miss the gravel) For anyone with gravel in there tank remove it now! The health risks are not worth it! WOW that picture is so bad, I wonder if the turtle survived. I'm glad I never put gravel in, just sand. I'm so glad I read this, I'm cleaning cages today (we have LOTS of pets), so I'll be pulling the gravel out today. We have gravel in our tank. I have noticed the female "biting" at the bottom. I give them shredded carrot, so I thought she was eating that...no; she was eating gravel! I did not think anything of it until I checked it out on-line. I have learnt a great deal of information, as I was totally green from the start! I ordered some river rock and I have purchased some polished rocks (?). I finally got the river rock and this weekend the gravel is OUT! I hope that Amore is okay. She has been basking and when she got back into the water, there were a few pieces of gravel on the dock. I can hardly wait to replace it with the large stones, but can anyone tell me why they eat gravel in the first place? What do they do in the wild? Anyway, the gravel is going tomorrow! Thanks for the detail info on this.